On 28 September 2000, accompanied by hundreds of police officers, former (notorious) general and politician Ariel Sharon paid a visit to the Haram al-Sharif – for Muslims, the third most holy site after Mecca and Medina. It was a deliberate provocation, and occurred at a time when tensions were already high, especially in light of the fact that Sharon had found common ground with radical israeli settlers who believed that the Aqsa Mosque and Dome of the Rock should make room for the Third Temple. Earlier, they had already provoked incidents on the Haram al-Sharif in the hope of triggering such events. 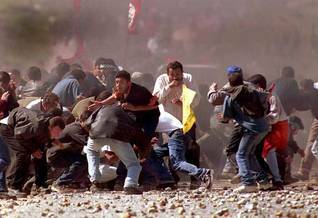 In September 1996, serious riots had erupted after the Israeli government opened up a tunnel to the public which ran under the complex. The Palestinians were quick to react to Sharon’s actions, taking to the streets in various places. From day one, the Second Intifada had a strong military character. This was in contrast to the First Intifada, which was supported by local committees and in which civil disobedience and demonstrations were the focus. In the first few days, for example, the Israeli police shot dead fourteen Palestinians of Israel. They had taken to the streets in order to proclaim their solidarity with the Palestinians in Palestine. Armed groups of Palestinians – tied to Hamas and the Islamic Jihad, but also belonging to al-Aqsa Martyrs Brigade, which was linked to Fatah – joined the fray in a confrontation with the Israeli occupying forces and the Israeli settlers. Israel reacted to the Second Intifada by temporarily reoccupying the large population centres, severely damaging the recently constructed PNA infrastructure in the process. 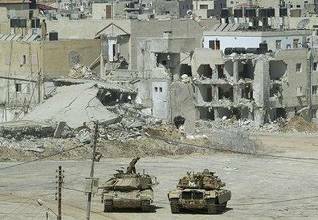 The refugee camp in the northern town of Jenin was besieged for ten days in April 2002 and almost totally destroyed. A number of leading Hamas members were assisinated by Israel, including spiritual leader Sheikh Ahmad Yassin and the prominent political leader Abdel Aziz al-Rantissi. In the period September 2000-July 2010, a total of 5,072 Palestinians died as a result of the violence (almost four times the number during the First Intifada) and 1,083 Jewish Israelis (figures from the Palestinian Center for Human Rights and B’Tselem respectively). Israeli leaders claimed that PNA President Arafat was responsible for the outbreak of the intifada. In reality, however, Arafat himself was caught up in the events. He had hardly any control over his own al-Aqsa Martyrs’ Brigade, and none whatsoever over the Hamas and Islamic Jihad militias. In the following years, this led to chaotic situations, and Palestinians increasingly directed criticism against the PNA, which was dominated by Fatah. From Israel, a campaign was launched to politically discredit Arafat – and thus the PNA. It focused on his autocratic style of politics and clientism, which until then had not been an issue for Israel. Moreover, he had purportedly turned down a ‘generous offer’ regarding the ‘distribution’ of territory in the West Bank. Thus Israeli politicians managed to convey to the West the impression that it was Arafat who was the obstruction to a political agreement between Israel and the Palestinians – and not, for example, the continuance of the occupation or the on-going settlement in Palestine. At the end of March 2002, the Israeli army besieged the PNA headquarters in Ramallah (the Mukataa or al-Muqata’a), and the building was heavily damaged. Afterwards, the Israeli army continuously laid siege to the complex, in effect placing Arafat under house arrest.